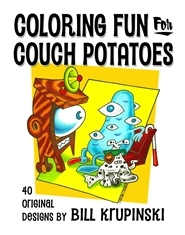 “Coloring Fun For Couch Potatoes…40 Original Designs by Bill Krupinski” Psychedelic “Art Therapy” for laid-back adults---settle in on your couch, grab your colored pencils and “space out” with this stunning collection of original artwork by illustrator and cartoonist Bill Krupinski. Amaze yourself and your friends by breathing new life into the intricate, asymmetric designs and whimsical cartoons. Ride your sofa to new horizons and lost worlds, emerging refreshed and invigorated. Yes! Yes, yes, yes!